sara jamshidi liked Dr Margaret Paul's blog entry. Think for a moment about the last time you got angry with someone. At that moment, what was most important to you—getting what you wanted or being caring? Deborah Fairfull LOVE this article, an important reminder to take care of our needs and sticking to saying "no" if what we are being asked is not in our best interests! sara jamshidi liked Tony Fahkry's blog entry. Does It Serve Your Highest Potential? Let the beauty of what you love be what you do ~... moreDoes It Serve Your Highest Potential? When do you feel engaged in the present moment? Deborah Fairfull I particularly love the part about the Schumann Resonances, a great reminder in how to go slower, to minimise stress and flow with life. sara jamshidi liked Anne McKeown's blog entry. Blisspot, sara jamshidi, and Deborah Fairfull like this. LaurenCrabtree Wow thank you for sharing! A friend of mine just finished her study in NLP and i find it so extremely interesting and insightful! I am going to try that little sticker exercise, sometimes its those small little things we do to alter our subconscious mind... moreWow thank you for sharing! A friend of mine just finished her study in NLP and i find it so extremely interesting and insightful! I am going to try that little sticker exercise, sometimes its those small little things we do to alter our subconscious mind that make the biggest differences! Deborah Fairfull Some fantastic tips is rising above stress, feeling calm and feeling empowered. sara jamshidi liked Sergei VanBellinghen's blog entry. Deborah Fairfull A great reminder that no-one can make you believe in yourself, you need to develop your sense of self-belief. When you believe in yourself others are more likely to believe in you too. sara jamshidi liked Dr Helena Popovic's blog entry. sara jamshidi liked Healing Music's video. Deborah Fairfull I LOVE this music. It soothes my mind and helps me feel relaxed and centred. sara jamshidi liked Deborah Fairfull's photo. Hello everyone, I hope your week is off to a great start. This is a great time to direct your thoughts to creating the life that you want using your mind. That includes working with your mind to solve problems in a way that helps you move... moreHello everyone, I hope your week is off to a great start. This is a great time to direct your thoughts to creating the life that you want using your mind. That includes working with your mind to solve problems in a way that helps you move forward. Your mind can work against you with negative thoughts and fixating itself on a problem. The key is to let go of the problem and allow "space" (rather than tension) within, for your inner wisdom to guide you in how to solve the problem in the best way possible. You will know when this is happening because it will "feel" right. Accepting your challenges opens the door to major breakthroughs, and the hidden opportunities surrounding them. To run away from your problems without facing the real issue only delays the healing process. Deborah Fairfull Challenging times are our opportunity to grow into feeling more aware and empowered. sara jamshidi liked Amaya Pryce's blog entry. Deborah Fairfull A great way to make our mind our friend and not succumb to fear. It is possible to find a quiet space beyond the "busyness" of our mind where we can tune into the wisdom of our intuition. Of course when we hear it, we need to TRUST it and act on it. I used to allow my busy mind and fear override my... moreIt is possible to find a quiet space beyond the "busyness" of our mind where we can tune into the wisdom of our intuition. Of course when we hear it, we need to TRUST it and act on it. I used to allow my busy mind and fear override my intuition all the time, making decisions that I would later regret. I have found over the years, that the more, I listen to my intuition, the stronger it becomes and the more my life flows. 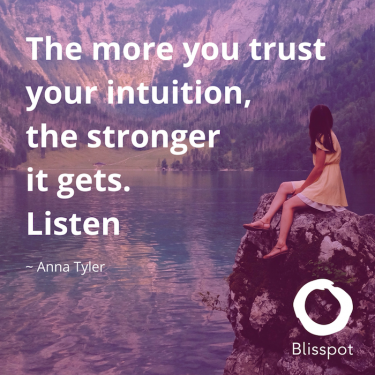 Does anyone have any stories they would like to share about trusting your intuition? Giulia Cugini, sara jamshidi, and Sierra Fairfull like this. 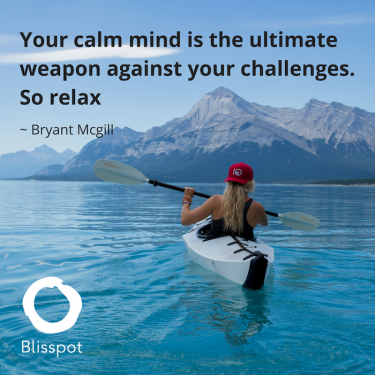 The calmer you are the more you will be supported in getting though the inevitable and daily stresses of life. I feel relaxed when I practice yoga, watch a funny movie or commune with nature.... moreThe calmer you are the more you will be supported in getting though the inevitable and daily stresses of life. I feel relaxed when I practice yoga, watch a funny movie or commune with nature. Deborah Fairfull I love this philosophy. We flow by growing and we grow by remaining open and receptive to new ideas. LaurenCrabtree Thankyou for sharing this wonderful knowledge! When i was younger i used to think i knew a lot more than i actually did, i was stubborn, which ultimately hindered me from taking in new knowledge. It was only through developing and uncovering my personal... moreThankyou for sharing this wonderful knowledge! When i was younger i used to think i knew a lot more than i actually did, i was stubborn, which ultimately hindered me from taking in new knowledge. It was only through developing and uncovering my personal legend that i realised i will never stop learning, and that perceptions are always subject to change, which truely beautiful. Sergei VanBellinghen LaurenCrabtree Thank you Lauren for your honesty and insight. It is wonderful to see that you have come a long way. And yes, we never stop learning and we shouldn't. Knowledge is a super power for us to use. ))) Have a great day. sara jamshidi liked Vance Larson's blog entry. Deborah Fairfull I practiced martial art in my early adulthood too and I LOVED it. What a wonderful practical article in how to stay positive and embrace life. Sierra Fairfull What great advice on keeping things positive! Seema asked me this question during one of my webinars. It’s a question that I‘m often asked. Deborah Fairfull Self-love is so healing and powerful in attracting the things that are good for us in our life. sara jamshidi commented on Amaya Pryce's blog entry. sara jamshidi commented on Anne McKeown's blog entry. Deborah Fairfull What a great list if attributes of a confident and fulfilled woman. I love the special reminders at the end about valuing yourself everyday. Thankyou for sharing Anne. LaurenCrabtree I love seeing such an awesome community develop here for empowering women, its so important to build each other up! Anne McKeown I agree Lauren - so many, willing to give so much! sara jamshidi liked Blisspot's blog entry.